Works by Modern Artists Highlight Skinner’s American & European Works of Art Auctions, September 23 | Skinner Inc.
BOSTON, MA – August 31, 2016 – Skinner, Inc. will present an impressive selection of American & European Works of Art at auction on Friday, September 23, comprising 428 lots in total. The day will be divided in two parts: Fine Prints & Photographs at 12PM and Fine Paintings & Sculpture at 4PM. The auctions showcase an extensive variety of paintings, sculpture, prints, photographs, and works on paper ranging from Old Master prints through Modern and Contemporary offerings. In conjunction with the auction, Skinner will be hosting a Young Collectors’ Night on Wednesday, September 21, at 6PM, an exciting evening of art and hors d’oeuvres welcoming young and beginning collectors. Learn about the basics of collecting and buying at auction, featuring a panel discussion with Skinner fine photographs specialist, Michelle Lamunière; curator and art consultant, Elizabeth Devlin; and gallerist, Joseph Carroll. Figurative artworks by European and American artists represent the top lots this fall season. With two works we look ahead to the cold weather: from folk artist Anna Mary Robertson, better known as Grandma Moses, we have on offer a humorous scene of a whole family working together to apprehend a plump turkey for their meal, titled Catching the Turkey, Thanksgiving (Lot 305, estimated between $90,000-120,000). 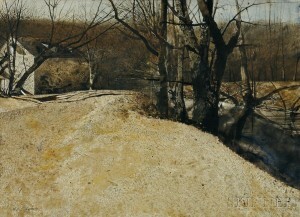 Realist painter Andrew Wyeth depicts a late autumn landscape with a barn, frosty, dark branches, and an icy stream in a 1976 drybrush watercolor titled, Corn and Grist (Lot 286, $150,000-250,000). Several works continue the figurative theme indoors with two still life works: British artist Christopher (Kit) Wood’s painting, Anemones in a Glass Jar (Lot 381, $70,000-90,000), portrays a vibrant bouquet of pink, violet, blue, and red anemones bursting from a clear, glass jar. American painter Wayne Thiebaud is known for his paintings of sweets, and his woodcut print, Candy Apples (Lot 91, $30,000-50,000), depicts nine glistening treats ready to be eaten. Passion is unbound in the figurative, compact sculpture, titled Amantes (Lot 427, $40,000-60,000), depicting two lovers indistinctly intertwined, by the Mexican artist Francisco Zúñiga. 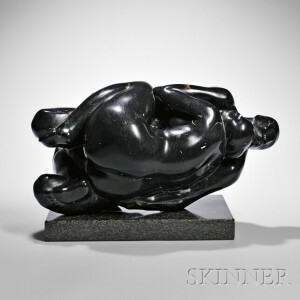 The fusion of the two bodies, cut from the same elegant black marble, conspicuously characterizes the act of love-making. 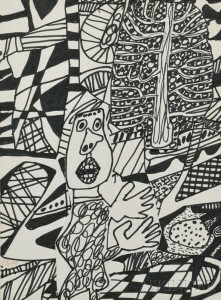 The composition by French artist J. Jean Dubuffet’s ink drawing, Situation LXXXXI (a l’arbre)(Lot 425, $35,000-55,000), is equally dense as the space around the central wandering, cartoonish figure is filled with doodle-like lines, semi-figurative forms, and patterns. Previews for the auction will be held on Wednesday, September 21 from 12PM to 5PM; Thursday, September 22 from 12PM to 8PM; and Friday, September 23 from 9AM to 10AM. Illustrated catalog #2930B is available from the Subscription Department at subscriptions@skinnerinc.com or from the gallery. Prices realized will be available at https://www.skinnerinc.com during and after the sale. The Skinner website also enables users to view all lots in the auctions, leave bids, order catalogs and bid live, in real-time through SkinnerLive! Skinner auctions draw international interest from buyers and consignors alike, with material regularly achieving record prices. The company’s auction and appraisal services focus on fine art, jewelry, furniture, and decorative arts from around the globe, as well as wine, fine musical instruments, rare books, Asian art, clocks, Judaica, and more. Widely regarded as one of the most trusted names in the business, Skinner appraisers have appeared on the PBS-TV series, Antiques Roadshow, since the show’s inception. Skinner has galleries in Boston and Marlborough, Massachusetts, as well as in New York City and Miami, Florida, with bidders participating in person, by phone, and online. Join auctions live with SkinnerLive! and Bidsquare. For more information, visit www.skinnerinc.com, find us on Facebook, or follow us on Twitter and Instagram. This entry was posted in News and tagged American art, Andrew Newell Wyeth, Andrew Wyeth, Annie Leibovitz, art, art auction, boston, Boston art auction, Carroll and Sons, Christopher (Kit) Wood, Contemporary Art, Elizabeth Devlin, european art, fine art, fine art auction, FLUX., FLUX.Boston, Francisco Zúñiga, Grandma Moses, J. Jean Dubuffet, Joseph Carroll, M.C. Esher, modern art, Old Master prints, paintings, photographs, prints, Richard Estes, sculpture, skinner, skinner auctions, Wayne Thiebaud, William Zorach, works on paper by Skinner. Bookmark the permalink.